New details emerge from "Holy Grail of Shipwrecks"
Image taken by the REMUS submersible showing the cannon that were on board the San Jose when it sunk in 1708. Credit: REMUS image, Woods Hole Oceanographic Institution. Explorers disclosed new details on Monday about the "Holy Grail of Shipwrecks," known as the San José. The vessel is a large 62-gun, three-masted Spanish galleon ship sank in 1708 while carrying cargo from Spain thought to be worth billions. Why it matters: : Explorers located the ship off the coast of Cartagena on Nov. 27, 2015. The find was announced at the time, but now explorers are disclosing more information about the wreck site, how they found it, and what Colombia plans to do with the ship's contents. 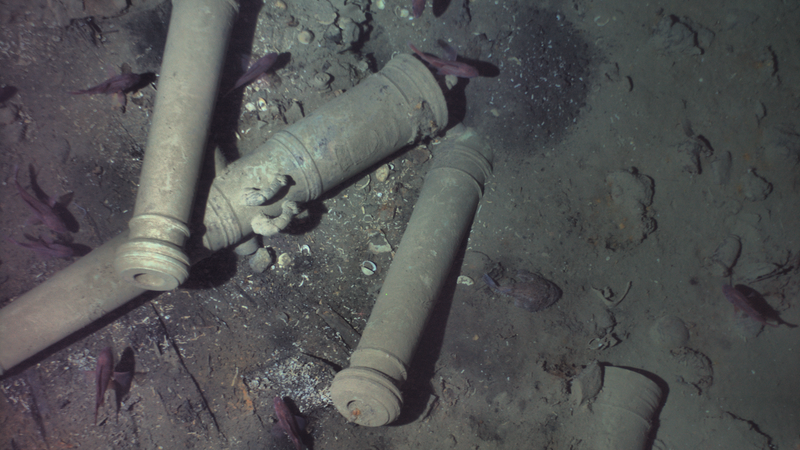 According to the AP, the shipwreck may contain riches that are worth as much as $17 billion in today's dollars. The discovery "carries considerable cultural and historical significance" for the Colombian people, according to the Woods Hole Oceanographic Institute (WHOI) , since it reveals information about European influence on South America during the early 18th century. The San José was carrying gold, silver, and emeralds, in addition to ceramics and other artifacts. The Colombian government is planning to build a museum and conservation laboratory focused on the ship's contents. The ship was discovered at a depth of about 2,000 feet by explorers from WHOI, Maritime Archaeology Consultants, Switzerland AG, and the Colombian government using assets that included an autonomous underwater vehicle known as the REMUS 6000, according to WHOI. The same underwater vehicle was involved in the successful search for Air France flight 447 in 2011, as well as a mission to map the Titanic wreck site 2010. The San José was partly sediment covered, forcing the REMUS to get within 30 feet of the ship. Experts were able to make out its distinguishing cannons once the REMUS' cameras neared to the wreckage. The Colombian government is still keeping the exact location of the ship, which sank in a battle with British ships during the War of Spanish Succession, under wraps.